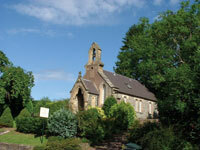 The Bluestone Church (formerly The Old Church) at St. Fillans on Loch Earn is a unique and charming 'listed' building. 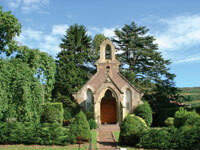 Crafted in beautiful bluestone in 1859, it still has its original bell tower. The cottage enjoys an elevated position overlooking the River Earn in the glorious and dramatic scenery of Perthshire in the Scottish Highlands. The surrounding area has been officially designated as one of outstanding natural beauty, and is simply stunning at any time of the year. Converted into a private dwelling in 1992, Bluestone Church stands in its own private gardens and has now been tastefully furnished into a very comfortable, modern and cosy home, offering Quality Assured 4-Star self-catering accommodation for 2 to 4 guests. St Fillans has a romantic and turbulent history, with fascinating tales of the Scottish Clans, their skirmishes, feuds and battles set against the backdrop of breathtaking scenery of rivers, mountains and lochs. A delightful community - the village is most attractive, sited along the shores of a beautiful Loch Earn- it is not surprising that it is a winner of Scotland's best-kept village. Loch Earn is the geographical centre of Scotland. A great place to base yourself for touring, within easy reach of the major and historic cities of Perth, Edinburgh, Stirling and Glasgow. Fantastic walking, hiking and biking in 'big tree' country. Paradise for golf enthusiasts with a great variety of courses nearby. Loch Earn is within 100 yards, for lovely picnic venue, and Trout & salmon fishing in the area, and water sports on the Loch. There are visitor centres and attractions to appeal to all tastes. Or if you prefer, a perfect place to 'drop off the planet', partake of a little Scottish hospitality and enjoy, at your leisure, the comforts of Bluestone Church. Bluestone Church has had some notable visitors in the past, including Queen Juliana of The Netherlands, and the American actress, Kathryn Hepburn who both took their holidays in St. Fillans. They are reputed to have been amongst past worshipers at this Old Church. Now we look forward to welcoming you too as our very 'special visitors'. 'Heaven on Earth' - look no further - you have come to the right place!